Think of the last time you did a tarot reading or had one. How many of the cards were reversed? Close to half? Well, of course! So why do so many books treat reversed cards in what is basically a cursory manner? 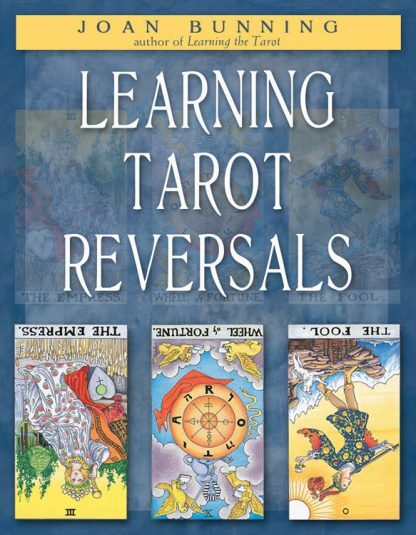 Joan Bunning to the rescue with Learning Tarot Reversals--finally reversed cards get the attention they deserve! Traditionally, reversed cards are read as the polar opposite of what the upright card represents. While this method of reading has its place, the effect of reversed cards, their number, groupings, and where they fall in a tarot spread can deepen any reading and bring subtle nuances into play. Bunning points out that a reversed card can also indicate a build-up to, lack of, or decline from the event or condition represented by that card. Linking cards together based on the presence of reversed cards thus gives a reading a natural flow of high points and low points without abrupt transitions. In a format usually reserved for upright cards, Bunning describes every reversed card in the deck--with a brief description of the upright meaning, and more detail about the reversed meaning. Following the format of her best-selling Learning the Tarot, Bunning, who is a masterful teacher, presents lessons that build on each other smoothly, allowing a student to progress to increasingly complex readings and understanding with ease. Bunning also includes a handy section of keywords for easy reference.